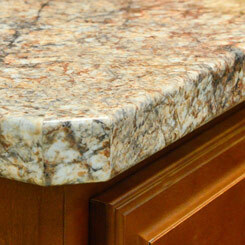 There are several choices that you can go for when it comes to selecting a kitchen or bathroom countertop. In most cases, the greatest factor that will determine what you go for is the budget you have for the project. In the event that money is not a problem, then everyone would go for the best countertops that are available in the market. There is nothing that would compare to a high-quality kitchen top that matches with the cabinets and complements the floor. However, to achieve this kind of elegance, you must be ready to pay a good amount of money for it. Some of the countertops that you can buy from the best and most expensive downwards are granite, stone countertops, solid surfaces, laminate, and stainless steel, concrete and last but not least is marble. We will look at each one of them into details so that you are in a better position to make your mind on what to go for. Formica countertops are the most commonly used countertop material. It is made of a mixture of laminate, and it is commonly known as Formica especially when you are going to make the purchase. The company that manufactures these materials is based in Cincinnati in Ohio and started in 1913. Many home builders, as well as homeowners, have always opted for these kinds of countertops since they come in different colors that you can choose from. Some of the most attractive colors that you can get represent artificial reflections that are there. On the other hand, there is the downside that comes with Formica countertops. Most of them, if not handled with care, easily get damaged. The surfaces that have this material should be handled with care and are not supposed to be used with the rough jobs. Cleaning is a bit technical when it comes to Formica too. For the lighter stains, you can use soap and water. However, the tough stains will have to be removed using baking soda, soap, and water. You should not clean the surface with anything rough as it will scratch it, damaging the smooth, shiny finish. This is one of the best surfaces that you will get and at a fair amount. The wide range of colors is also another factor, but this does not mean that it will be easy for you to choose; there are many colors, so it will be quite complicated for you to select the right one. But what really affects the price of these types of countertops? The layout of your cabinets is one of the reasons. In the event that you have several surfaces that form 45 degrees angles, this will add to the amount you will be charged. The color and the finish too will be a factor. The high gloss type is much more expensive when compared to the matte or the stipple designs. In the event that you want custom made edges and not the regular ones, then you will definitely pay more for them. Raised counters will cost you more than the lower ones since the surface to be covered is large. Longer counters will also be more expensive due to the surface area that will be covered. How then can you reduce the cost? • If there will be any corners, then they should be 90 degrees. • The countertop should not be too long, not more than 12 feet. • There should also be no granite patterns on the surface. The company that manufactures these surfaces was founded in 1956 and as continued to provide excellent products throughout the years. This is the material to go for when you do not want to spend too much, as it is reasonably priced. With this, you have the options of getting different designs like the curved ones or the inlays. They also come in different colors that you can select from. These colors do not fade away, and they can match any décor. It is also easy to take care of these materials since they are easy to clean and do not easily get damaged. You can use a mild detergent and the surface will be spotless and as good as new. However, you are not supposed to use acidic cleaners as they will damage the surface. This is definitely the materials to go for in the event that you want to remodel your kitchen into something that looks classy and elegant. The technology that has been used to design these materials is what makes them so attractive. • They have an easy maintenance and cleaning procedure since the most commonly used detergents will work just fine. However, make sure that you don’t use or spill anything acidic on them, as they will get damaged within no time. • They are cheap to buy and install too. This is actually the reason why so many people go for them. In the event that you have a large surface that needs to be covered, then this would be the best material. • They have a sleek, stylish design which means that your kitchen and bathroom will look all glamorous. • There are many new and better patterns that are there in the market; therefore, you have a wide range of options. • Firstly, you must have it very clear in your mind what you want. The size and where the material will be installed are key considerations. • There are many types of laminate materials which are designed for different surfaces. There are those that are best suited for the kitchen counter while others are best suited for the bathroom and other areas. Therefore, you select depending on where it will be installed. • There are different designs like oiled bronze, satin, and white bronze which are very shiny. They make the kitchen look really classy, so go for the design that you want. • The color that you go for should complement the other colors that are in your house and kitchen. However, you can also go for a perfect contrast that aims at making the kitchen look different in a good way yet homely too. • The type of edges that you want is another consideration. There are those that have a wooden edge, which are much more expensive than those with rounded edges. The nature of the finish will be a determining factor in the price, as well. • You should carry out some tests that will help you determine if they are durable or not. Solid Surface Countertops are the types of surfaces that have been existence the longest. They are easy to clean, they have a smooth uninterrupted finish and they have a uniform kind of appearance. They are also very durable when compared to all the others discussed above. The amount that you will pay for them will be determined by the size of the surface to be covered. Cleaning is easy too since they can easily be cleaned with just soap and water. The location where the surface is will determine the kind of finish that you will have. There are those used in kitchens, workstations, and other areas. The kind of work done on the surface will determine the kind of finish. There are also other different materials that can be used in the finish like granite countertops and quartz countertops depending on what you want. Where are the installations done? Countertops are installed in different areas such as the kitchen and the bathroom. There are some materials best suited for the bathroom while others are best suited for the kitchen. On the other hand, there are those that are suitable for both areas too. Additionally, these surfaces can be installed both at home and in commercial areas too. Residential areas, such as the kitchen and bathroom have these surfaces as well as commercial areas like a bar countertop, the reception desk, and writing surfaces in banking halls. Contact us, or give us a call at 918-779-7330 for help in determining the best material for the design and style that you wish to accomplish.